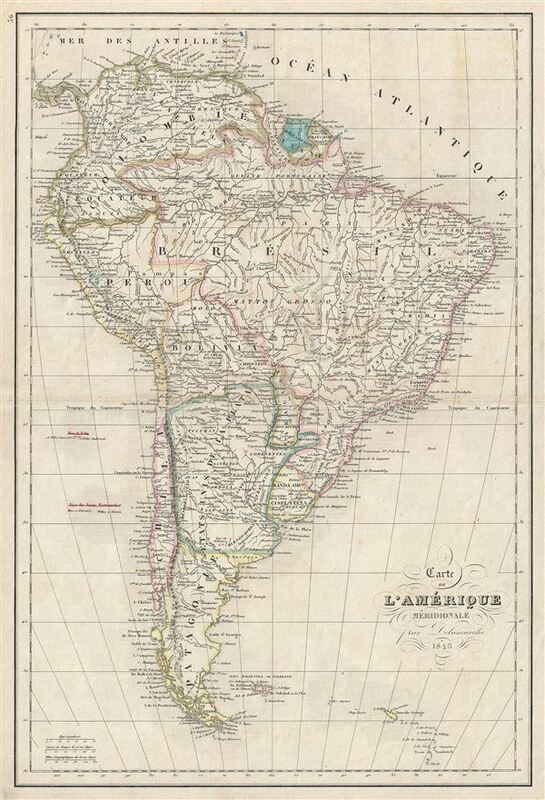 This is a beautiful example of Alexandre Delamarche's 1843 map of South America. It covers the entire continent from the Caribbean to Tierra del Fuego and from the Pacific to the Atlantic, including the Falkland Islands. It includes the modern day nations of Colombia, Guiana, Brazil, Peru, Bolivia, Paraguay, La Plata, Chile, Patagonia and the Falkland Islands. Much of South America was, at this time, embroiled in or about to become embroiled in, severe civil strife. The new nations, freed from Spanish dominance though various wars of liberation in the previous decades, were struggling with their newfound independence in an attempt create stable and prosperous governments. Most would dissolve into civil war between 1858 and 1864. Throughout, the map identifies various cities, towns, rivers, mountain passes and an assortment of additional topographical details. Political and regional borders are highlighted in outline color. This map was issued by Alexandre Delamarche as plate no. 36 in his Atlas Delamarche Geographie modern.